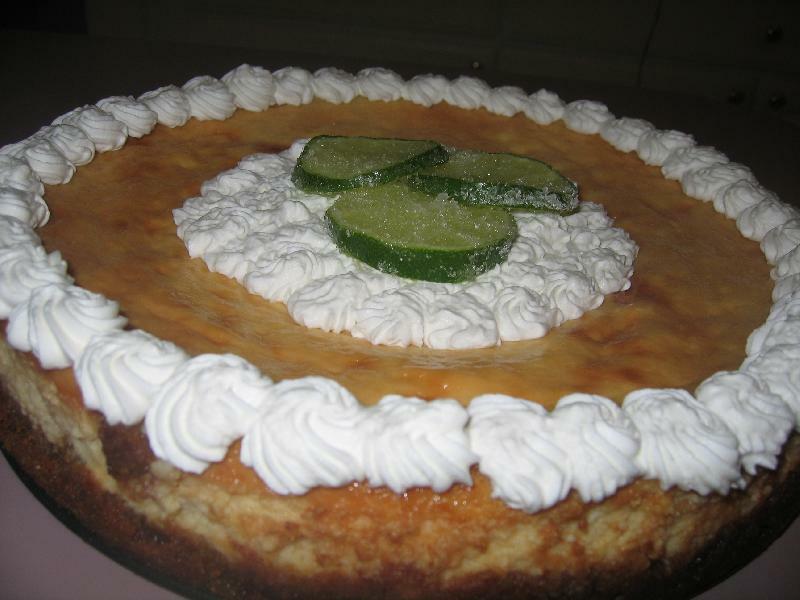 This recipe comes from http://www.tasteofhome.com/Recipes/Two-Tone-Cheesecake but I have altered it to be a Key Lime Cheesecake. I used the rest of the heavy whipping cream and a few tablespoons of sugar to make homemade whipped cream. Be sure to place the bowl and mixing attachment into the freezer to chill before whipping the cream. I also used a lime. I sliced it into coins and then rolled them in sugar before placing on top of the cheesecake. In a bowl, combine cracker crumbs, sugar, and butter. Press into the bottom of a greased 10 inch springform pan. Place on a baking sheet. Bake at 325 degrees for ten minutes. Cool on a wire rack. In a large mixing bowl, beat the cream cheese and sugar until smooth. Gradually beat in cream. Add eggs; beat on low speed until combined.
. Pour over the crust. Return the cheesecake to the baking sheet.Bake the cheesecake on a baking sheet at 325 degrees for 65-75 minutes or until center is almost set. Cool on wire rack for 10 minutes. Carefully run a knife round edge of pan to loosen. Cool one hour longer.Meanwhile, place the whipping cream in a chilled mixing bowl to mix. After the cream is whipped you can use a pipping bag and a tip to create a border on the cheesecake.